Was the call from my eight year old son this morning. I had just offered him a graham cracker that was covered with what we call “Nature’s frosting”: butter. 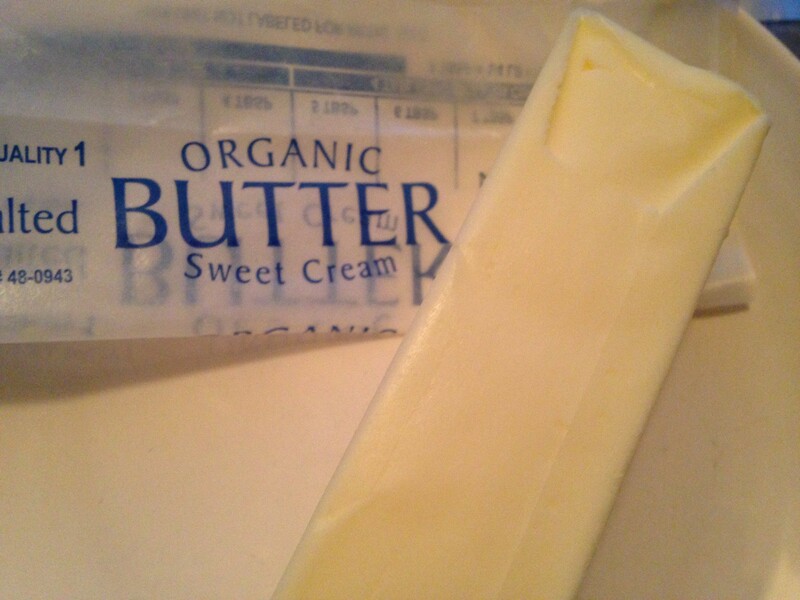 Organic butter, that is…a good half inch high. Why did he question whether it was butter, you ask? Ah, the tale I will tell! Can anyone guess? The COLOR. The color of the butter was very light yellow to almost white. The color my son is used to seeing is YELLOW. Is this significant? YES. The color of the butter will let you know that the cows ate GRASS. We KNOW that what cows eat is highly significant: to the cows, the Earth, and our bodies. What is very interesting to me (and should be to you also) is that the butter was ORGANIC. This is significant also… It tells you that even though butter may be organic, it in no way means it comes from grass-fed or pastured cows. (It does currently guarantee that the grains the cows are fed are organic– which will guard you from the GMO-laden feeds used in conventional dairies. ) Why should you care? Folks all over the country are starting to wake up to preferring grass-fed or “pastured” dairy products including butter, milk, cream and cheese. Grass-fed or pastured dairy is nutritionally superior to dairy that comes from grain-fed operations. And not only that, but it also comes from cows that are raised on pasture, as Nature intended them to be… Not in the confinement feeding operations (CAFOs, confined animal feeding operations) that became so popular in this country in the eighties. Beautiful YELLOW grass-fed butter!! Homemade! So in this case, “the eyes have it”: rich, yellow butter IS better. And use it liberally, folks. Nature’s frosting. Why I don’t like (Meatless) Mondays! Hello dear readers! Happy New Year to all of you! I am writing because it is Monday…a Monday suggested to be “Meatless” by Food, Inc. and others. (Yep. All over FB today.) Heck, there’s a whole website and movement dedicated to it. It’s the start of a new year, and I’d just like to clear something up from the get-go. The vast majority of meat eaten in America comes from CAFOs. Yes, it does. That burger at your favorite burger joint, that filet mignon at that fancy French restaurant, the taco at your favorite Mexican restaurant…nearly all the beef in every supermarket in the country including Whole Foods Market (unless it is marked “grassfed” and “grass-finished”.) But let us not confuse meat from CAFOs with meat from animals raised on pasture as they are meant to be. Grassfed and -finished meat is good for the planet, good for the animals and good for you and your health. One just cannot compare CAFO meat with grass-fed and -finished meat. So let’s not lump them together, shall we? The health problems attributed to meat is not the meat that is raised on pasture, sustainably. Grass-fed meat is good for the planet. Grass farming sequesters carbon! This knocks out the popular argument that eating meat contributes to global warming… “if you care about the planet, stop eating meat”. Oy. If all cows were on pasture, we would not have the methane gas problem that we do today, nor many of the other problems that feedlots produce including runoff and water pollution. The High Priest of Pasture, one of my heroes, Joel Salatin, talks eloquently about carbon sequestration all the time. Here’s a great talk Joel gave at TEDMED in DC April 2012. Chris Kerston of Chaffin Family Orchards also spoke on How Grassfed Beef will Save the World last November at the Weston A. Price Foundation annual conference. Grass-fed meat is good for the animals because…well, duh. Animals are meant to express their “animal-ness”, to paraphrase Joel Salatin. Cows and bison are meant to eat grass. Chickens are meant to eat grass and bugs. It’s “humane” if that fits for animals, it’s ethical, and it’s natural. What’s good for the animals is good for us. Read on. Grass-fed meat is good for us to eat because it is more nutritious, leaner, and chock full of Omega 3s (those Essential Fatty Acids your brain and your body needs) and CLAs (conjugated linoleic acid…with anti-cancer properties and many other good things!) Everyone knows that the nutrient profile of meat depends upon what the animal (or bird or fish) is fed. Meat from animals raised on pasture is simply more nutritious because it comes from animals that ate what they are supposed to eat. Grass. Also, you know this food is more nutrient-dense because you are not hungry an hour or two after you eat! You are satisfied. But again, this is America, and the vast majority of meat eaten in this country is from animals in CAFOs. Not kidding. We can continue to patronize our crazy food system that perpetuates the confinement model, or we can make another choice; take a different path. Truth is, I would love it if EVERY day were declared a CAFO-meatless day! Can you imagine if everyone stopped eating meat from animals raised on feedlots or in cages? The entire fast-food industry would come crashing down…supermarket meat shelves would bulge with burger patties and steaks and hot dogs and sausages…and chicken tenders and breasts until they rotted past their expiration date. People would be healthier! Hospitals and doctors and prescription drug makers would have no takers! We would have more energy due to more nutrients in our bodies AND less toxins from our food. Heck, I daresay we would have a revolution on our hands! Let’s make EVERY day a CAFO-meatless day! Or to say it differently, let’s make every day a pastured meat day! Vote with your pocket book, folks! Seek out meat from local sources (or not so local when necessary) that raise their animals on pasture. And make it a CAFO-meatless Monday! And Tuesday! And Wednesday! And…you get it. 😉 Eat Wild is a great site to find local grass-fed meat. And check with your local WAPF chapter for farmers, farmers markets, and CSAs near you. I was fortunate to have the opportunity to attend this year’s Fourfold Path to Healing conference in Baltimore this past weekend. It was my second year; last year I flew to San Francisco to attend and exhibit. This year, I was asked to teach a day of pre-conference cooking classes and make pate’ for 200 or so people for the opening reception Friday night. I also exhibited and helped to be sure the food functions went smoothly, that is, WAPF style. Here and there I was able to catch bits of Dr. Tom Cowan’s lectures, 10 minutes here, 20 minutes there, and those bits made the conference worth it for me. Here’s why, and why I love this conference. The Fourfold conference is based on the book of the same title, which Dr Cowan is the primary author. The other two authors are Sally Fallon (now Morell) and Jaimen McMillan. The book talks about just what the title says: what Dr Cowan believes are the four paths to healing-nutrition, therapeutics, movement and meditation, and the conference is built on the same. Participants have the opportunity to go deep in three of the paths with one of the authors…you guessed it: Sally talks about nutrition, Jaimen does Spatial Dynamics, and Tom therapeutics. To me, meditation, aka spirituality infuses the whole thing. That’s the point here, folks. The one that just thrills me to my core… Here is a medical doctor, looking at and talking about health, healing, wellness and dis-ease in the body through the lens of spirit. The lens he uses is called “anthroposophy“, which was brought forward by Rudolf Steiner in the early 1900s. How cool is it that a MD is looking at the human body and what goes wrong with it and what goes right with it through the lens of spirit? Very cool. The only thing that is cooler is that 200 or so people came to hear him. And I was one of them. Dr Cowan looks at patterns as he endeavors to discern what is going on with each patient. He encourages us to use “macroscopes”, not microscopes. He has no use for minutiae. Dr Cowan knows that the clues and the answers will be found in the big picture. This is why he asks his patients to tell him their story. In the story lies the clues to why particular symptoms are showing up in the body. When was the last time your MD asked you to tell your story?! The lens or metaphor that Dr Cowan used was the Threefold plant. He likened the human to a plant, divided onto 3 sections-head or flowers, middle or stem and bottom or roots. (Here’s where I encourage you to read the book and get more information for yourself; remember, I was running in and out and coordinating food and caught bits and pieces. May this interpretation pique your interest and lead you to seek more. I do not claim that I “got it all” folks. This is my best rendering. :)) By looking at the characteristics of the symptoms and where they showed up, one could determine which plant remedies (often homeopathics) would help guide the person through the symptoms to relief. One thing that struck a truth chord for me was Dr Cowan’s statement that if acute symptoms are allowed to run their course, they will not turn into chronic symptoms. When was the last time you let a fever or pneumonia (the body’s cure for asthma) run its course? Dr Cowan also talked about the Fourfold human. Unfortunately for me, I missed the beginning of the session but what I did hear was fascinating, and made so much sense. I am eager to learn more. I look forward to finding my Fourfold book and reading it cover to cover. If you are looking for a new (though based on an old-anthroposophy) way of looking at the human body, the human being, and well-being, I encourage you get a copy and do the same! FYI, Dr Cowan is available for phone consultations if you are not in the San Francisco area. He also offers his own Community Supported Healthcare program. Check it out!! Eggnog Made Right is a Super-Food! Yes, it’s true! Eggnog a super-food! But this is not your ordinary, store-bought eggnog. It is not even the organic eggnog available on supermarket shelves. It is eggnog you make yourself, from pure, nutrient-dense ingredients in their most natural state: clean, pure, fresh milk, raw egg yolks from pastured hens, fresh grated nutmeg and perhaps a dash of cinnamon. Some folks like to add cream, but my experience with fresh raw milk is that it is do rich, the cream is not needed. Let me tell you how I happened upon this: I was working at the annual Weston A. Price Foundation conference in Dallas last month, Wise Traditions 2011, coordinating all the food and acting as liaison between WAPF principles and the kitchen staff for 1200 or so participants. Long days, lots of running, to put it mildly. I needed my body to keep up the pave, and I needed my mind to stay clear. I was blessed to work with Mike Mudrak, (who was what I called a “runner”; others would call him a “gopher”, amd oh what a running gopher he was!) I got to meet Mike’s wife Judith. (Judith runs an annual tour to her native Switzerland every year through WAPF.) Every morning, they started their day with eggnog. 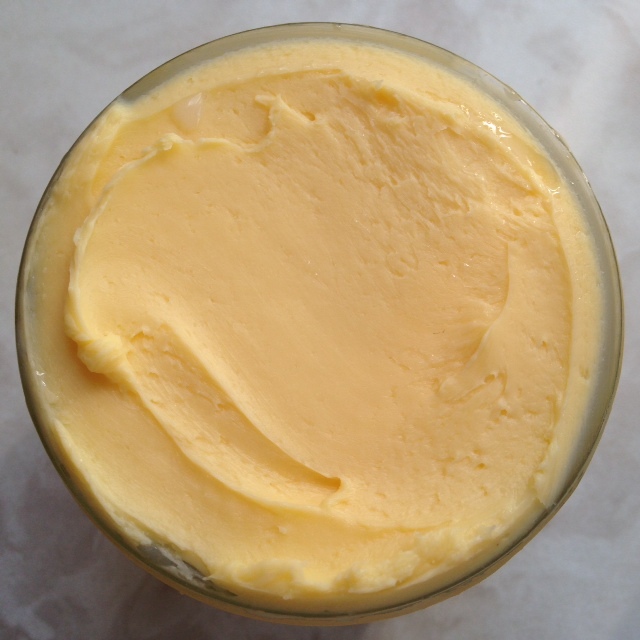 This was a simple recipe: raw milk and raw egg yolks; often 5 yolks to about 8-12 oz. of milk. Stir. Down the hatch! I was a disbeliever-and then I tried a glass. (Truth be told, Judith took it easy on me and I started with a small glass and 3 yolks instead of their usual 5 or 6.) Wow! Nutrient-dense Nirvana! That cup of power got me through for hours! And my thinking was sharp and clear, even though I had been working for days! If you are blessed in this country to have access to fresh, clean, raw milk and pastured eggs, make this super-food for your family! Especially your children! Don’t hold back! They need the calcium and the fat and the choline in the yolks for their brains! Enjoy! Enjoy! And happy holidays to all of you who celebrate the season! P. S. I do not encourage you to try this with pasteurized milk or cream. Organic or not, from grass-fed cows or not, pasteurized milk is hard to digest for most people and is just not worth it. A possible compromise: use watered down organic, whole milk, plain yogurt with pastured egg yolks. Just “up” the number of yolks and add vanilla and a bit of maple syrup to counter the sour yogurt taste!